Reliance Industry 42 AGM event chairman Mukesh Ambani announced that 4G services will be started as of September 5, 2016. Reliance Jio customers talk all calls free with 1GB 4 G plan just 50 Rs. plan. December 31, 2016 will continue until all free services. All customer free plan like as data plan, SMS, voice call and other service to be continue with free on December 31, 2016. 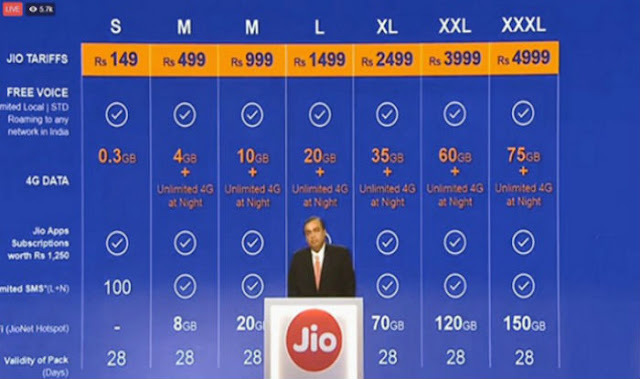 Reliance Jio claimed that Ambani’s data plans are the most affordable and cheapest in the world. So main Indian telecommunication company airtel, idea and Vodafone to lose his share on that day. Mukesh Ambani's Reliance Jio first dedicated vision to be Modi's “Digital India” campaign go ahead. His says Data plan more like as human oxygen, everyone need to oxygen and never shortage. The world cannot remain behind the new round and India. Jio mission in 2017 90 %Indian population to cover his scheme. Reliance Jio will revolutionize the health and education sector. Since its launch or announce, India's global ranking of the top 10 speed Internet providers will improve and increase and India will join. Voice Calling or Messing, Just three month free or lifetime? All customer just data, SMS and voice calls, all such offers shall be free from 1 September to 31 December. Voice calling will be free Lifetime. But data tariff charge Jio plan. What voice calls free services only Jio to Jio, Jio to other network? The company claims that the whole of India, on any network, anytime voice calling will be free Lifetime. 4G plan free, when will the charge? 4G data plan will remain free until 31 December. Then the data will be charged according to the tariff Jio. India’s population is 125 million. Just 2/3 of people are online. Reliance's mission is to cover within a year to 10 million internet users. Reliance in this sector to invest 134 crore rupees invest in telecommunication. Company targeted maximum download speed upto 135 Mbps. Most of internet provide company only voice calling infrastructure but no any data plan infrastructure. After which they are ready. Company have already strong infrastructure. Company claim 90% Indian population cover and serve. Now a days, RJio the world's largest 4G LET network and voice over. India world's cheapest and most expensive out of the data market data market will take. Indian 70% Smartphone 4G LTE. Also provided 4G LYF smartphone price just avail between Rs. 2999 to 5999 only. 4G LTE Jio 5 router available on Rs. 1999 only. Focus on keeping the entry price has been at least cheap. Jio Live TV customers through more than 300 channels to watch. The 6 thousand live cinema library of movies and TV episodes will be 1 million available. Jio music will be available on 1 million songs. Money cashless transactions you will be able to live through. The app will be free for all by 31 December 2017. Jio all services process will be redesign. This service will continue on today for Delhi & Mumbai. Will apply in the next 6 weeks in whole India. With 10 million users a gather or join this community and network. Stating processor or step will be easier. Aadhar card with Passport size photo and online e link to connect just 15 minutes.